June 18, 2012 (Lake Forest, CA) – The etnies Skatepark of Lake Forest, along with Pierre-Andre Senizergues, World Champion Skateboarder and etnies’ Owner and CEO, will attempt to make history in the Guinness World Records by teaching the world’s largest skateboard lesson in a skatepark on Go Skateboarding Day, June 21, 2012. The public event, including an amateur best trick contest, etnies product giveaways and free food, is hosted by the etnies Skatepark of Lake Forest, in conjunction with etnies, Team Thomas and the Pediatric Cancer Foundation. Free to everyone who wants to be a part of skateboarding history, Go Skateboarding Day at the etnies Skatepark of Lake Forest begins at 3 p.m. with the Guinness World Records attempt from 6 p.m. to 6:30 p.m. The skateboard lesson will be taught by Pierre-Andre Senizergues and Nick Gates, etnies Skatepark of Lake Forest Coordinator. The demonstration will be for skateboarders of all levels and will need as many participants as possible to make it into the Guinness World Records. To participate, skateboarders must bring their own skateboard, helmet and excitement to set a world record! “Please come join us to celebrate Go Skateboarding Day, help set a world record, and celebrate a great day at the best skatepark around in honor of Thomas!” said Nick Gates. This Go Skateboarding Day event is in memory of Thomas Johnson, a young, local skateboarder, who lost his battle with cancer in 2010. The Pediatric Cancer Research Foundation and Team Thomas, a community created in support of Thomas Johnson to raise money for pediatric cancer research, will benefit from any donations made during the event. In honor of Thomas, attendees are asked to wear orange, Thomas’ favorite color. – 4:30 p.m. – 5:15 p.m.: Best trick skate jam. – 6 p.m. – 6:30 p.m.: Guinness World Records attempt. – 6:30 p.m. – 8 p.m.: Free food provided by Rasta Tacos. Go Skateboarding Day, a global celebration founded by the International Association of Skateboard Companies (IASC), is the official holiday of skateboarding that gives skaters and non-skaters alike a chance to take a break from their normal obligations and make skateboarding their top priority on June 21st of every year. For more information on the Guinness World Records attempt at the skatepark and other event information, visit etnies.com, facebook.com/etnies or the etnies Skatepark of Lake Forest at http://www.etniesskatepark.com or http://www.facebook.com/events/270776803020837/. Established in 1986, etnies is the first skateboarder-owned and operated global action sports footwear and apparel company. etnies not only pushed the envelope by creating the first pro model skate shoe, but it pioneered technological advances and changed the face of skateboard footwear forever. Today, etnies’ vision, led by owner and skateboarder Pierre-André Senizergues, is to remain the leading action sports company committed to creating innovative products that provide the most style, comfort and protection possible. etnies stays true to its roots by sponsoring world class skateboarding, surfing, snowboarding, moto x, BMX and auto teams and continues its dedication by giving back to each of these communities. 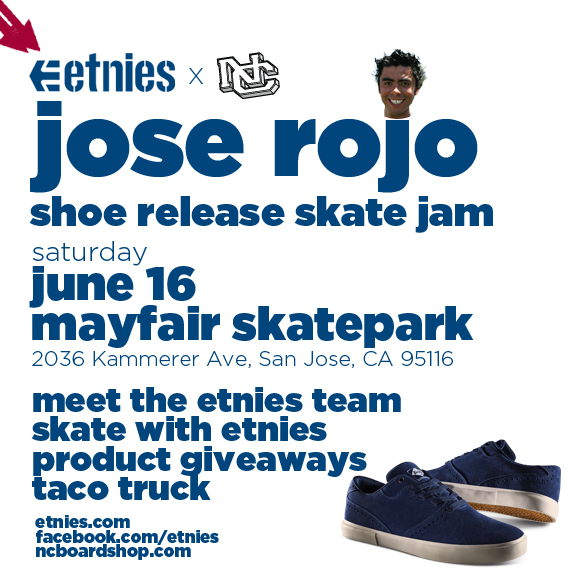 For additional information, visit etnies.com.